Everything you send to `foo@hostname` will be send to all subscribers, but they will see only certain headers and the body of your email. The selection of these headers can be configured for each list individually by the list-admins. Each Schleuder-list replies with its public key to any email sent to `foo-sendkey@hostname`. E.g. to receive the key for our contact address write an email to `team-sendkey@schleuder.org`. Schleuder knows some special keywords that trigger different behaviour. You can e.g. subscribe someone, or resend an email to a non-subscriber using keywords. See a list of available keywords below. * the email must be *encrypted and signed* by a list-member's key. * the email must be formatted as a *plain text* message and not with HTML, RTF or similar formatting. Keywords can be repeated within one email at will. There are two types of keywords: those to enhance messages sent over the list ("list-keywords"), and those to request something from Schleuder ("request-keywords"). : **You must always provide this keyword once per email. ** Without it, no other keyword will be considered but you will receive an error message. This list describes changes that users or list-admins of Schleuder should be aware of. For a more technical changelog, please see the [repository](https://0xacab.org/schleuder/schleuder). * To improve consistency with the English language, `X-LISTNAME` has been renamed to `X-LIST-NAME`. `X-LISTNAME` still works, but will be deprecated, therefore please use `X-LIST-NAME` from now on. * Lists can have an internal-footer now. It's appended to each message sent to a subscriber (if it's not blank). * New keywords: `X-RESEND-UNENCRYPTED` and `X-RESEND-CC-UNENCRYPTED`. With them you can enforce that resent-email will be sent in the clear, regardless of whether we would find a key for the recipient or not. * The short representation of GnuPG keys became more human-friendly. Besides the fingerprint we now show the email-address of the first UID, the generation-date, and (if present) the expiration-date. * The resend-keywords now check the given arguments to be valid email-addresses, and block resending if any one is found invalid. * `X-LIST-KEYS` does not require an argument anymore. * `X-SUBSCRIBE` now handles the combination of space-separated fingerprint and additional arguments (admin-flag, delivery-enabled-flag) correctly. * `X-RESEND` now respects the encoding the mail was sent with. * Fixed broken encoding of certain character-sequences in encrypted+signed messages. 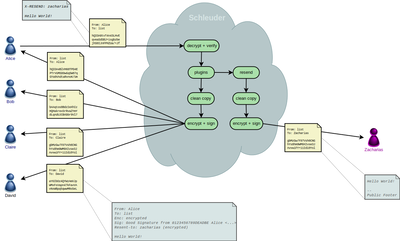 Schleuder is a gpg-enabled mailing list manager with resending capabilities. This document tries to explain what that means. Schleuder enables subscribers to communicate encryptedly and pseudonymously. It takes care of all de- and encryption, stripping of headers, formatting conversions, etc. But Schleuder can also receive and send emails to non-subscribers, which makes it a useful email hub for groups. Incoming emails from non-subscribers ("outside people") are (re)encrypted and distributed among the subscribers, which can communicate internally as well as answer to the outside person via the list. The outside person only sees an email address with a public key, but has no information about who is behind it. Here's a simple picture of a message that is sent to a non-subscriber ("Zacharias"). It illustrates how Alice, Bob, Claire and David are invisible to Zacharias (click image to enlarge it). Additionally, Schleuder can send out its own public key upon request by email. Anyone sending a message to `listname-sendkey@hostname` will receive a reply that contains the public key of that list. And Schleuder can receive administrative commands by email. E.g. it is possible by email to add an OpenPGP-key to a list in order to reply encryptedly to an outside person. Basically Schleuder is a "wanted man-in-the-middle". Each list has its own keypair. Schleuder decrypts every incoming email and verifies its signature with the keys from the list's keyring. Then Schleuder loops over the list of subscribers, creates for each a stripped down copy of the message, encrypts it with the subscriber's key and signs it with its own key, and sends it out. The consequence of this approach is that you need to *really trust* the provider that runs Schleuder: they could store and decrypt all emails that pass the lists, if they wanted. Schleuder behaves like an email-filter: it reads email from standard-input, and reports errors to standard-error. If all goes well Schleuder closes the initial connection to the Mail Transport Agent (MTA) only after it sent out all outgoing emails. In case of an error the MTA includes Schleuder's error message into a bounce-email that is sent back to the sender. The keyrings for each list are standard GnuPG keyrings and sit in the filesystem under `$lists_dir/$hostname/$listname/` ($lists_dir is read from `schleuder.yml`, see [Configuration](#configuration)). They can be used manually using gpg2. Please be careful to maintain proper file permissions if you touch the files. In the list-directory there's also a list specific log-file (might be missing if the log-level is high and no error occurred yet). Other logging is sent to syslog. Where that ends up depends on the operating system and the system administration. All other list-related data is stored in the SQL-database. Most data is unserialized, only some values are JSON-encoded. 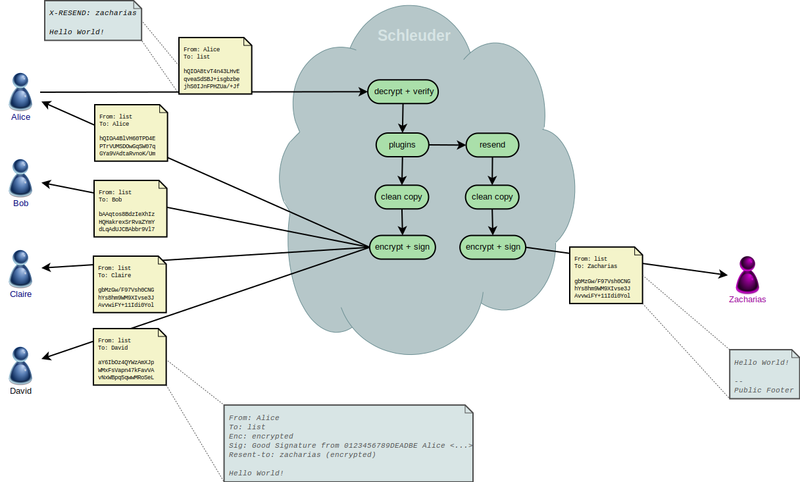 Changes to the previous version of Schleuder are summarized in [changes](changes.html). These keywords must be send to `foo-request@hostname`. They are used to get information about the list, its subscribers and keys, or to change that information. : Subscribe the given address and assign it the given OpenPGP-fingerprint. : Unsubscribe the given address. : Assign the key with the given fingerprint to your subscription. : Assign the key with the given fingerprint to the given subscription. This variant of this command may only be used by list-admins. : Lists all public keys known to the list. To see only keys that match a given string, use `x-list-keys: something`. : Import the attachments or the rest of the email-body into the list's keyring. Only ascii-armored keys are supported. : Delete the key with the given fingerprint from the list's keyring. : Export the key with the given fingerprint from the list's keyring. This keyword must be send to the normal list-address: `foo@hostname`. : Attachs the public key of the list. Probably most useful in combination with x-resend. These must also be sent to the request-address: <foo-request@hostname>. : Sends the logfile of the list. : Returns the version of schleuder. : Sign the remaining contents of the email body or the attachments with the list's key. Use this e.g. to provide GnuPG-signatures for things you are publishing. The resending-keywords must be included in messages sent to the normal list-address: `foo@hostname`. : Send the message to the given address, encrypted if possible, otherwise in the clear. : Send the message to the given address only if it could be encrypted. Can be abbreviated to `x-resend-enc`. : Send the message to the given address without encrypting it. You can use this keyword to make schleuder skip looking for a matching key for this address and enforce sending the email out in the clear. : Send one message to all of the given addresses in Cc, so they get to know of each other (encrypted if possible, otherwise in the clear). : Send one unencrypted message to all of the given addresses in Cc, so they get to know of each other. We skip looking for any key and will just send out the email in the clear. Write to `foo-owner@hostname` to contact the list-owner(s) even if you don't know who they are. Use the list's key to encrypt the email!